I don't claim to have a reliable methodology for predicting the outcome of political elections -- for those I defer to William Stickevers. Using the findings from my independent research linking political ideology to astrology, however, there seem to be a number of factors suggesting that the nation of France will veer conservative over the next decade. These factors appear to be stronger than similar factors which have suggested a libertarian/conservative turn for the US. 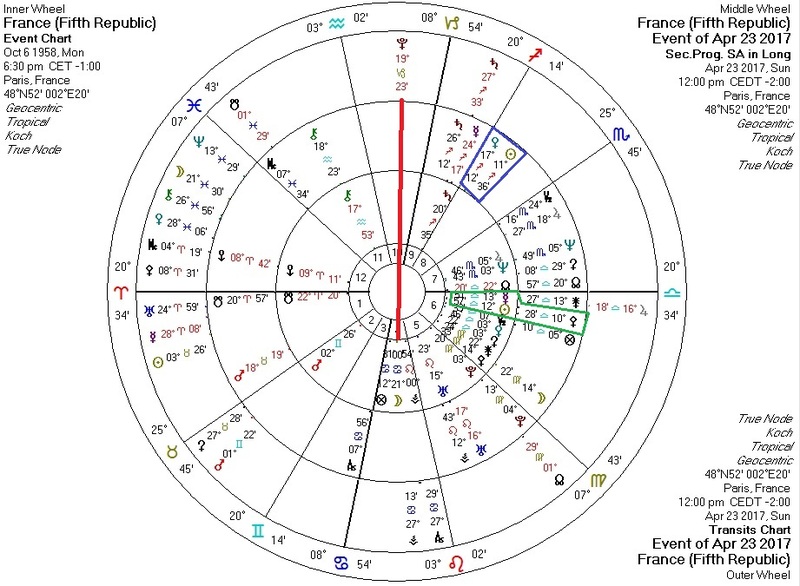 These are transits/progressions for France for today. Transiting Pluto opposite France Moon (ruler of France IC): extreme changes to culture may be afoot. Note that France has had massive Islamic immigration for decades. "Multiculturalism" is the status quo and therefore is now subject to change? Progressed Pallas approaching France Sun/Mercury: this is a waxing libertarian vector, similar to but stronger than the one the US has been under. Freddy McGruberApril 23, 2017 at 8:46 PM They have gone so far left for so long though, and that makes me wonder where they will end up in a decade from a right/libertarian turn. Even if it only effects stopping and removing the Islamic fundamentalists I suppose it's a miracle, but some pushback on overall govt controls would be amazing. Seeing the level of police state presence out there is disturbing and sad, armed citizenry would be much more effective (I can dream!). ReplyDelete Spacer79April 25, 2017 at 5:44 AM The powers that be are trying to rig the election in France just like in the U.S. election. Will France overcome them? I hope so. ReplyDelete Replies astrolibertarianApril 25, 2017 at 7:11 AM William Stickevers says the geodetic Aries ingress this year with Venus at the MC may suggest a female takes power. I don't think he has done a full predictive workup on this election. Delete Reply Spacer79April 25, 2017 at 9:45 PM Female takes power - Marine the Lioness who has Leo Sun! It sounds good. We can hope. In some ways I think she is better than Trump.